How Many Types Of Carpet Cleaning Are There? While you are spoilt for choices when selecting a carpet cleaning company for your business, it is important to understand the different types of carpet cleaning methods used by different companies as not all might work for your carpet. Commonly known as steam carpet cleaning, hot water extraction use high pressure hot water to agitate the carpet fibres and dissolve the dirt trapped in them. An average sized carpeted office of 3000 sq. ft. would normally take about 2 hours to clean and the rug would need at least 4 hours to dry. 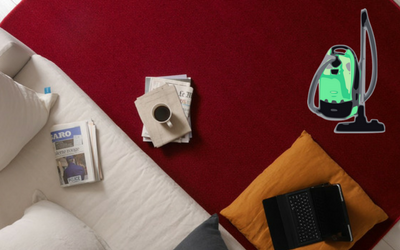 Most cleaning companies would advise carpets to be cleaned in the late afternoon so that after the day's work is done, the flooring can be left to dry overnight and office operation can resume back to normal the next morning. Shampoo carpet cleaning was popular till encapsulation technology was introduced in 1970s. While shampooing of carpet may seem to clean heavily soiled rugs, the technology’s disadvantage of leaving behind high amount of wet foam residues in the carpet that takes a long time to dry, becomes sticky when it dries because no rinsing is done after shampooing and rapid re-soiling of carpet makes this cleaning method less popular than others. Foam encapsulation uses synthetic detergents as base that will crystallise into powder form when dry. Loosened dirt particles in carpet fibre will be encapsulated into powder when the applied cleaning foam dries and, finally, vacuumed or brushed when the foam dries after cleaning. The foam encapsulation cleaning technique has overtaken carpet shampooing technology as the former uses less water, which results in short drying time. the top part of the fibres using a heavy duty motorised machine having a spinning pad that has been immersed in some effective solution to absorb dirt from the surface of the flooring. Based on the type of the carpet you have, consult with a professional carpet to come to a conclusion about the most suitable cleaning method. To know more about different aspects of commercial cleaning, stay connected to our blog space.